While international and national NGOs, National Tiger Conservation Authority, the World Bank, Global Tiger Initiative and Global Tiger Forum, and many others were taking a 'stock' of world's tigers in Delhi for the past 3 days, one more tiger out of this 'stock' was poached and chopped into pieces by barbaric human beings, whom we all know as 'poachers'. 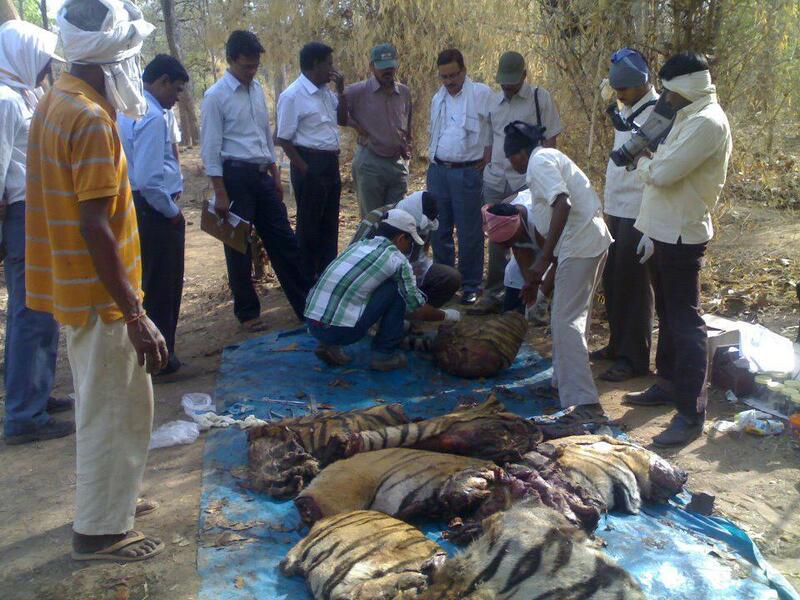 Another tiger has been ruthlessly killed near Tadoba-Andhari Tiger Reserve (TATR), Chandrapur, Maharashtra. The poachers carried its head and paws and left the remaining body, cut into pieces around 15 km from TATR. The poachers are believed to be of Bahelia community of Katni, Madhya Pradesh. The poachers dared this heinous act when the Forest Department of the State has already issued a RED ALERT in the State in anticipation of tiger poaching incidents! What an irony of sorts! All those deliberations, articulate powerpoint presentations, discussions over cocktails and 5-star food over 3 days between world tiger experts, top-most forest officers, conservationists, scientists and NGOs, weren't enough to do what needs to be done...PROTECT EVERY TIGER in this country & the world, and at any cost. The Global Tiger Recovery Program aims to double the numbers of wild tigers by 2022. With all due regards to the prestigious organisations involved, it seems a very difficult task to achieve in India, unless the MoEF and respective State Governments take stringent steps. Perhaps now a blame game will start in Tadoba...as the tiger was found dead outside the TATR, so is it from the tiger reserve or the surrounding forest division? A few transfers...maybe as 'punishment'. But will this solve the problem? Will this ensure safe haven for tigers in India's forests. In this case, however, the forest department has no choice but to accept this incident as a clear case of poaching. Had the body been intact, an autopsy would have been conducted and the post-mortem report would elaborate the cause of death in scientific terms, which would not make any sense to a lay man and certainly DOES NOT indicate the circumstances that lead to its death. It is highly shameful that despite a 'red alert' and 24X7 surveillance, the forest department could not prevent such an incident. 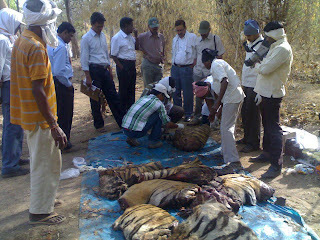 Only two weeks ago, another tiger was killed in Tadoba by poachers. While the tigers in Protected Areas are relatively safe, they are under severe threat in the sink areas like territorial forest divisions and forest corridors. How many more tigers need to die untimely before common sense prevails and strict anti-poaching measures are taken by every State of this country? Why can't every tiger reserve have fully equipped tiger protection forces with sophisticated weapons, vehicles and trained commandos who can deal with any eventualities? Why can't the Kaziranga model that has successfully dealt with poachers, be implemented in other States? Are tigers (and other wildlife) in Maharashtra and other States less important than in Assam? Armed anti-poaching patrols must be stationed at all tiger reserves, national parks, wildlife sanctuaries and the surrounding sink areas to deal with poachers and other mafias. We ALL must unitedly let the governments know that we the PEOPLE of this country will not take such incidents lightly in future. The forest department MUST at any cost do whatever they can to protect the tigers and other wildlife in India's forests. Many of the tiger reserves now have enough machinery to deal with poachers and other anti-social elements; thanks to the generous donations raised through NDTV campaign and Wildlife Conservation Trust. The forest departments have now nothing really to crib about being ill-equipped and short staffed. Protecting wildlife is their job and duty, and they must do it with all sincerity. If anyone lacks the necessary passion, vacate the seats for more deserving individuals who have the fire in their hearts. Any further nonsense and diplomatic explanations should not be tolerated. Enough is enough! The Corbett Foundation strongly condemns this incidence and demands an urgent probe and strictest punishment to the guilty. I am from Chandrapur and been to Tadoba number of times. This is shocking as well as shameful incident. The TATR officials shoudl take the completel; responsibility of this incident and implement certain measures to avoid such events in future. Tigers living in Periyar Tiger reserve do not wish to be disturbed by millions of men and thousands of vehicles speeding. Adani Power Ltd. has been granted permission to dig out coal for their power plant from buffer area of Tadoba Tiger Reserve in Chandrapur, the very home of Tigers who are already nearing extinction and goverment wants to destory their home i.w Forest to dig out coal for private companies, how can we stop this ???? poaching is still going on in these reserves?N why aren't these poachers like samsher chand hanged to death?Why aren't there stricter conservation laws in india? |are there natural protected siberian tiger reserves in canada? I am ready to work in protection of tiger r you ready to give me job in any tiger reserve. I am a wild life cinematographer. thats were we fail, this thought process kills us, Its responsibility of government to give us job, and perform well in conservation too, we loose to our families and their greedy needs. Why can't our country take poaching seriously and punish all poachers?